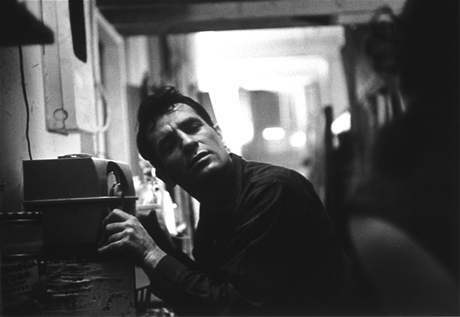 Jack Kerouac, ardent spirit of the Beat Generation, often described his style of writing as “sketching” – an “undisturbed flow from the mind of personal secret idea-words”. There's even a book about it. When he wasn’t “blowing” wild and free like his hero Charlie Parker, Keroauc was using language to gleefully draft his technicolour impressions. So detailed and vibrant were his memories on the page that they became our own. In the same year, disappointed by publisher Harcourt Brace’s choice of cover for his novel The Town & the City, Kerouac designed his own for On the Road, but the book was rejected and lay on the shelf till 1957. But type in “Jack Kerouac” and “painter” and you get very few Google search results, and no images of author at work. This is quite surprising as we are talking about one of the most iconic cultural figures in post-war America. And certainly among the most written about. Some fans will know that in the Fifties he hung out with the New York School – Abstract Expressionists such as Willem de Kooning, Larry Rivers, Franz Kline, and Dody Muller (who became his lover). Many are patrons at the 10th St Taverns in the chapter ‘New York Scenes’ in Lonesome Traveller. “They all belong to Kerouac’s poetic universe: that world in which all is fleeting and must be caught instantly, before one moves on to further experiences,” says Sandrina Bandera who is the president of Museo Maga and former director of Brena Museum in Milan. Apparently, Kerouac’s interest went beyond mere appreciation. He wasn't just a fan, he was a student. “He liked to sit in my studio and watch me paint,” Muller once recalled. “He admired, envied, and was awed by the painters.” So it shouldn’t come as a surprise that the fabled poet and author of On the Road was himself a keen artist in the gallery sense. But what would you say if I told you he created stacks of pieces between the late Fifties and early Sixties, from doodled portraits to impressionist scenes and abstract mysteries? Following the successful exhibition of around 100 of his works at Museo Maga – originally given to his brother-in-law John Sampas but later acquired by private collectors – we can all see another side to Kerouac as Skira publishes Kerouac: Beat Painting. This is only the second print presentation of Kerouac art after Departed Angels: The Lost Paintings, which accompanied the exhibition at New York University in 1994. And the fourth time that more than a handful of his pieces have been shown together, following Beat Culture and the New America: 1950-1965 at the Whitney Museum in 1995 and Beat Generation at KZM and Centre Pompidou between 2016 and 2017. The book is divided into four key sections: A Personal Album (sketched portraits of friends and inspirations), Visions of Jack (sacred imagery, religious iconography), Beat Painting (meditations on the theme) and Abstract Expressionism (gestural, near formless blasts of energy). The essays that precede each chapter help us to trace his evolution as an artist and lend valuable context to the work. Here are a few interesting observations. Kerouac took a trip to Europe in 1957 and visited Provence, the places frequented by Cézanne, and then Paris and the Louvre. “What he absorbed there and aspires to is “exact painting (not imitating) of nature,” says Francesco Tedeschi in the introduction to Abstract Expressionism. Meyer Schapiro taught art history at Columbia University from the 1930s up to 1973. “It was he who aroused the Beats’ interest particularly in Van Gogh and Cézanne, whose works Schapiro considered to be the foundations of modern art,” says Tedeschi. He struggled to reconcile Catholicism with Buddhism. On the one hand, a devout faith and puritanism instilled by his Franco-American mother. On the other, a spiritual self-less quest for enlightenment in the moment. Or true liberation as he imagined in The Dharma Bums: “I sighed because I didn’t have to think anymore … completely relaxed and at peace with all the ephemeral world of dream and dreamer and the dreaming itself.” The death of his saintly elder brother (aged nine) and the resulting shame compelled Kerouac to write the hagiographic Visions of Gerard and liken himself to Judas in comparison to his Christ-like brother. Gerard was a “spiritual hero, destined to be an angel of Heaven”. That guilt tore him up and you can feel the inner conflict and pathos in much of his confessional writing and painting. In his writing and pursuit of “spontaneous bop prosody”, Kerouac wanted to remove all “literary, grammatical and syntactical inhibition”. He also wanted to tear down the walls between different forms of artistic expression. You can feel the same restless energy and rebellious spirit as you move from front to back of this book. His unwillingness to sit on a particular style for too long, "to break down every distinction between art and life" as critic Harold Rosenberg explained in his book about action painting (The Tradition of the New). After all, this is the man who was “desirous of everything” and "running from one falling star to another". So he moves from charcoal on paper etchings (The Slouch Hat, 1960) to figurative oil-painted portraits such as Woman (Joan Rawshanks in Blue with Black Hat), the psychic abstractions (The Silly Eye) and "Surrealisme" on the book's cover. Some of his art popped with colour and romanticism, for instance the untitled portrait of a girl in a green dress as she lies in a forest. Others are dark and ominous, like a grey scene from the crucifixion. I won't attempt to describe the collection in detail, not least because most are untitled and without date, and all are open to interpretation. Instead, here is a selection of favourites. And he’s right – the last part anyway. If you are Jack Kerouac, people will either expect innate genius or ridicule any attempt to switch medium. There is rarely a middle ground. These works are certainly more than naïve curios from a great author. Although they fall short of being hung masterpieces, they are a fascinating visual diary of a turbulent period in his life, and a resource that you can cross-refer with his writing. The accompanying timeline, which parallels key events in politics and the art world beside major Kerouac milestones, is also very useful. Kerouac: Beat Painting is published by Skira and available here.